Flash floods ripped through Ellicott City, Maryland, Sunday as more than 8 inches of rain dumped down in the span of about five hours. Powerful flood waters turned the city's Main Street into a river and swept away cars like they were toys. The same street was devastated by deadly floods nearly two years ago. Parts of Howard County remained under a flood warning early Monday, but Storm Team4 says the threat for more heavy rain has passed, and the likelihood of more flash flooding is decreasing. Maryland Gov. Larry Hogan declared a state of emergency and visited Ellicott City late Sunday. Hogan told the news media the city had recently received $1 million for flood control as a result of the 2016 floods. "It took two years to get the money and it's ironic that we just got it this month," Hogan said. "Nobody expected another storm of this magnitude to come two years later because, as I said, they're only supposed to happen every 1,000 years." Howard County Fire & EMS responded to multiple water rescues and fire officials told residents at one point not to call 911 if they were in a safe place. "If you are trapped, we are coming," Howard County Fire & EMS tweeted. Crews as far away as Northern Virginia helped with rescues. The fire department said it also responded to reports of buildings collapsing. Howard County Executive Allan Kittleman said authorities aren't aware of any fatalities or missing people. Kittleman said at an outdoor news conference he toured the historic county seat after the flash flood receded and was "heartbroken" it was so severely damaged again. As he spoke, Maryland Lt. Gov. Boyd Rutherford put a comforting hand on Kittleman's back. Kittleman says he considers the damage worse than the flooding two summers ago that claimed two lives. Of the city's residents and business owners, Kittleman says "they are faced with the same daunting task again.'' But he says: "We will be there for them as we were in 2016." A flash flood warning is in effect for parts of Howard, Frederick, Carroll, Baltimore and Anne Arundel counties in Maryland. Flood warnings are also in effect for that region. See the list of all weather alerts here. Fire officials advised not to try to drive through or cross roads with standing water. People who need shelter can go to the Roger Carter Community Center at 3000 Milltowne Drive, Howard County Recreation and Parks tweeted. If you are in the downtown Ellicott City area or know of family/friends who live there: Please AVOID the downtown area. If you are in a vehicle - DO NOT DRIVE THROUGH FLOOD WATER. Turn Around, Don't Drown. 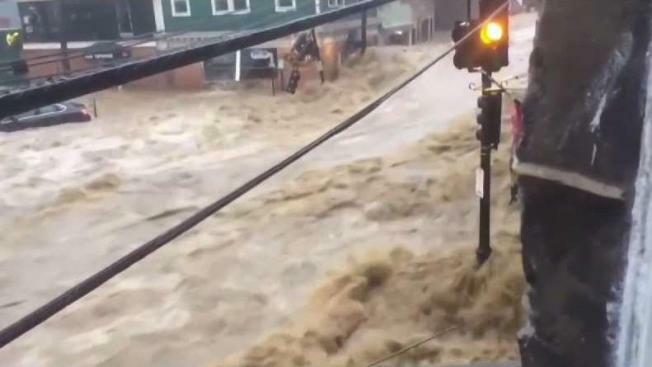 Videos posted to Twitter show massive floods sweeping through Main Street in Ellicott City, which was closed for months after the floods on July 30, 2016. Jessica Ur, a server at a cafe on the city's Main Street, told The Baltimore Sun she saw the gushing brown waters carry three or four parked cars down the street. The newspaper reports that the swirling waters reached the second floor of one building at its height. But by about 7:30 p.m. Sunday, the newspaper reports, much of the water had subsided and rescue officials were walking around the downtown area while making sure people evacuated. Spokeswoman Karen Spicer in Howard County says she has no immediate information of any deaths after the flash floods. Information still is preliminary, however, and authorities say they are still checking flooded buildings and streets. Storm Team4 declared Sunday a Weather Alert Day. A flash flood watch has expired for the entire D.C. metro area. 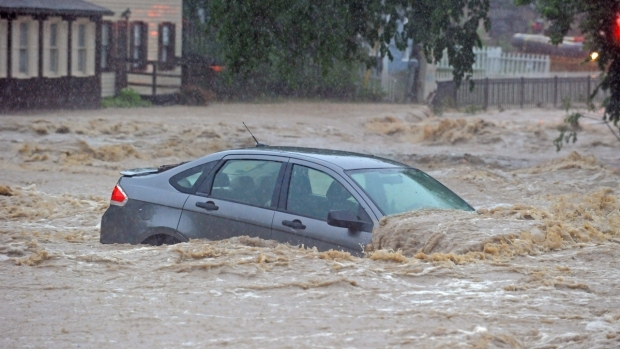 Residents should take extra precautions and remember to never drive through a flooded road.